Amsterdam Churches & Synagogues – Inspirational religious sites are scattered throughout Amsterdam, each with its own history and reason for being. 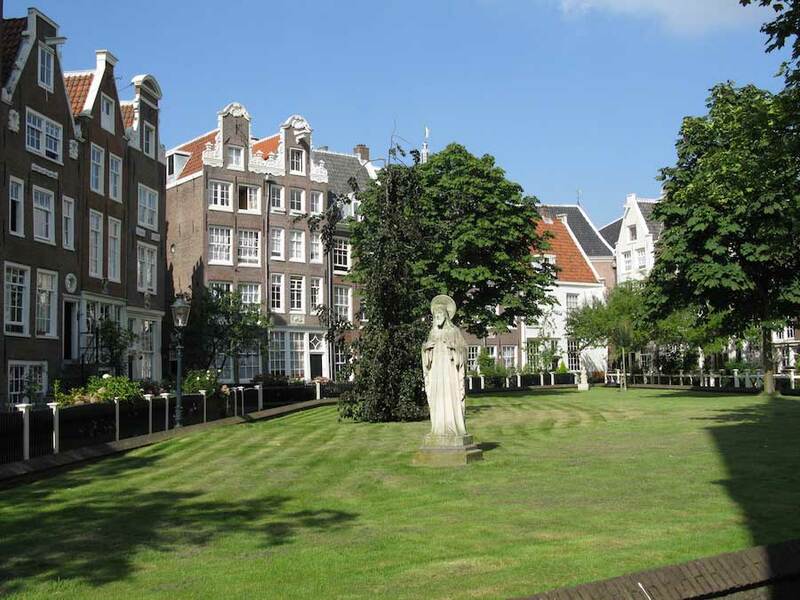 Whether it is your desire to worship or to delve into the rich history connected with the location, we at Amsterdamapartments.com have assembled a short list of the most popular churches and synagogues in the city. Begijnhof – 14th century convent. This tranquil courtyard oasis known as Begijnhof was once a convent for a Catholic sect of women called the Begijntjes. It is also the location of the oldest house in the city – Het Houten Huis also known as the Wooden House and the Engelse Kerk (English Church) constructed in the early part of the 15th century. Begijnhof Chapel, which dates from the late 17th century, remained a refuge for practicing Catholics during the Reformation. While there is no cost to enter the courtyard, know that most of the buildings are privately owned and occupied. Begijnhof, Begijnhof 30, Amsterdam. Tel: +31 206 221 918. De Nieuwe Kerk – New Church. Located in the middle of the city centre at Dam Square next to the Koninklijk Paleis (Royal Palace), this monumental Gothic style church is one of the city’s oldest buildings. It is still used for state occasions and official Remembrance Day services but is now also an exhibition centre and concert hall. There is an iPhone App about De Nieuwe Kerk (App Store code DNK ENG). Admission is free to organ recitals for those with a valid admission ticket of De Nieuwe Kerk, De Nieuwe Kerk Dam, Amsterdam. Tel: +31 206 386 909. Noorderkerk – North Church. This 17th century Roman Catholic church, located in the romantic Jordaan neighbourhood along Prinsengracht canal, dates from 1623. It is memorable for its striking architecture featuring a balanced cross layout with a small crowning tower. The church still provides weekly worship services and each Saturday from September to June it is the place to attend classical music concerts. Each Saturday on Noordermarkt Square look for the organic farmer’s market and frequently a trendy merchants market featuring second hand books and clothing as well as antiques. Noorderkerk, Noordermarkt 44-48, Amsterdam. Tel: +31 206 266 436. Oude Kerk – Old Church. Located in the Red Light District of the city, this early 14th century church dedicated to St. Nicholas, Amsterdam’s patron saint, is Amsterdam’s oldest church. Concerts are frequently held in the church and the carillon may be heard daily. The church has the largest medieval wooden ceiling in Europe and the main floor was created using more than 2,500 gravestone markers. Oude Kerk, Oudekerkplein 23, Amsterdam. Tel: +31 206 258 284. Portuguese Synagogue – also called the Esnoga. Completed in 1675, this remarkable building is an important site for Jewish history in Europe, Portugal, Spain and the Netherlands. The last one standing – this is the synagogue that survived the Nazi occupation. The floor is covered with sand, as is the Dutch custom, and brass chandeliers hold more than 1,000 candles providing the only lighting inside. The Jewish Historic Museum is across the street. Esnoga, Mr. Visserplein 3, Amsterdam 1011 RD. Tel: +31 206 245 351. Synagogue Gerard Dou – One of the oldest Ashkenazi synagogues. Built in 1892, this synagogue also survived perhaps because of its inauspicious architecture. Today, traditional Dutch Jewish melodies and rituals, the authentic interior and the welcoming atmosphere make services at the Gerard Dou street shul inspirational. Synagogue Gerard Dou, Gerard Doustraat 238, Amsterdam. Saint Nicholas Church – Tribute to Amsterdam’s patron saint. This church was constructed in the late 19th century and remains one of the main Roman Catholic churches in the city. It has a spectacular Sauer organ and its extensive music offering includes psalms repertoire, Dutch and English choral music, Latin polyphony and Gregorian vespers. Every Saturday at 5pm from September to June, the choir performs the choral evensong. Saint Nicholas Church, Prins Hendrikkade 73, 1012 AD Amsterdam. Tel: +31 206 248 749. Westerkerk – West Church. Standing next to Prinsengracht Canal, this awesome 17th century Protestant Renaissance church with its grand clock tower is one of the city’s most important landmarks. It is the location where Queen Beatrix was married and reported to be the site of Rembrandt’s grave. Each Tuesday between noon and 1pm, the carillon of 50 bells is played just as it has been done throughout the centuries. Westerkerk, Prinsengracht 279 281, Amsterdam. Tel: +31 206 247 766. Zuiderkerk – South Church. This stoic 17th century church was the first Protestant church in The Netherlands. Zuiderkerk’s tower is perhaps one of the best in the city and worth the climb for the view. Zuiderkerk has transitioned to become a museum that showcases Amsterdam’s town planning through the centuries. Each Thursday the carillon is played between noon and 1pm. Rembrandt was a parishioner and three of his children are buried in South Church cemetery. It is also rumoured that he created his famous ‘Night Watch’ painting in the Church. The Church has also featured in one of the French impressionist Monet paintings. Admission is free. Zuiderkerk, Zuiderkerkhof 72, Amsterdam. Tel: +31 206 222 962. Ons’ Lieve Heer op Solder – Our Lord in the Attic. A wealthy merchant by the name of Jan Hartman purchased a luxurious property in the mid 17th century, a time when public practise of Catholicism was forbidden. Being a devout Catholic himself, Hartman decided to construct a hidden church, concealed in the upper three levels of his canal side dwelling. For the ensuing two centuries, the attic served as a parish church for the city’s Catholic inhabitants, until the ban was lifted and the residence subsequently opened its doors to the public, becoming the second oldest museum in Amsterdam. Ons’ Lieve Heer op Solder, Oudezijds Voorburgwal 40, Amsterdam. Tel: +31 206 246 604. Note: This information was accurate at time of posting but please be sure to confirm details directly with the location of your choice before making plans.